After their hugely successful collaboration, Munich-based retailer MyTheresa.com has partnered up with Prada once again for a second 20-piece capsule collection. This time around, the fashion powerhouses took on a new approach by tapping into Prada’s archives and reviving the Italian fashion house’s most coveted 2010s pieces like the S/S 2012 flame print sandals and the now-iconic S/S 2011 banana pattern. 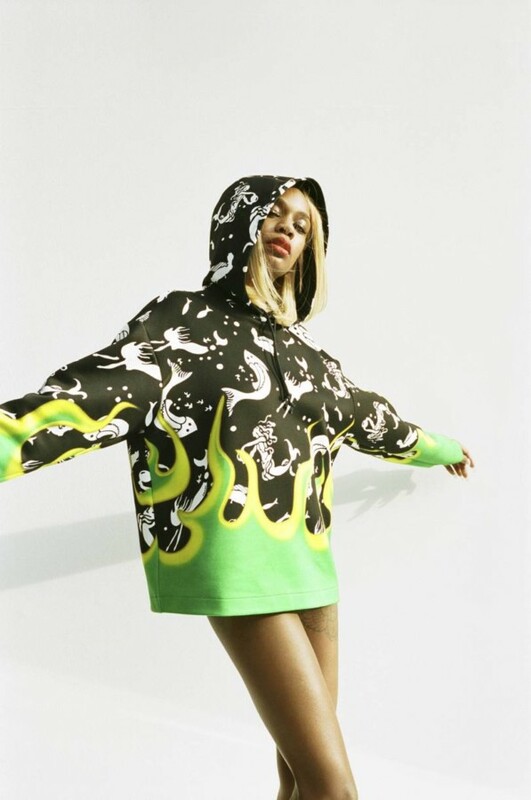 And Atlanta-based artist ABRA—whose alternative style embodies the feel of the pieces—is responsible for bringing the collection to life. A campaign video created by the two brands sees the singer belt out her hit single ‘Fruit’ whilst donning key pieces from the collaboration. Comprised of two patterned hoodies, five dresses, three tops, two cashmere jumpers, and two bags; the collection also includes what is predictably its standout item (and ABRA’s favourite), white sandals, accented with pink flames. You can’t get more noughties than that.